The ReadySet is a versatile renewable energy charger that can power any gadget that plugs into a standard vehicle or usb port. The ReadySet’s intelligent battery means that it can be charged from a variety of sources including solar panels, bicycle generators, micro-wind turbines, and much, much, more. 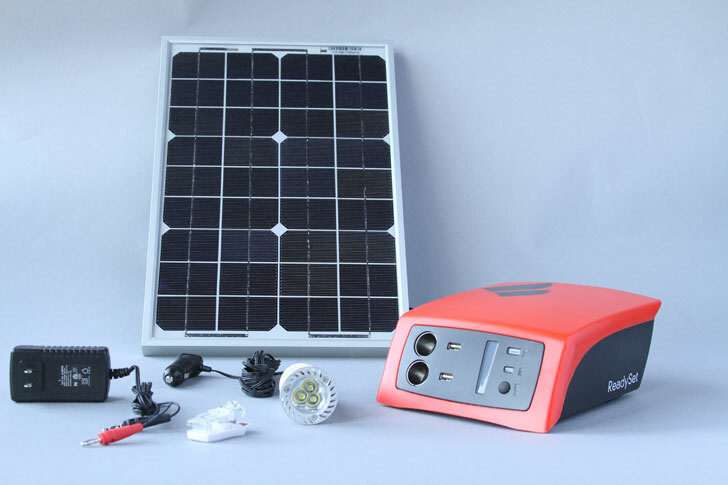 The Kickstarter project by Fenix International reached its $20,000 goal in one day, and by purchasing a ReadySet Solar Kit you will help expand Fenix International’s office to Rwanda and support their mission to deliver power to the 1.5 billion people who live without electricity. See a video on how ReadySet created a phone charging business in Africa after the jump. The ReadySet charger is great for everyday use, but it’s even handier during times of need – especially following natural disasters. The charger ensures that you’ll have power on hand to get in touch with loved ones, have light at night, and even power a mini stove to heat water and cook food. In Uganda, the ReadySet has created a great entrepreneurial opportunity by helping individuals set-up a successful phone charging businesses and delivering much-needed to power to the local community at night. The applications for the ReadySet charger are endless, and we personally enjoy the ability to spend an entire work day at the park. Go purchase your own ReadySet and make a pledge to deliver power to the developing world.